The City of Fremantle Art Collection is the largest municipal art collection in WA with over 1,400 pieces from historical works to contemporary paintings, prints, photographs and ceramics by WA artists, focusing on Fremantle makers and subjects. For further enquiries or to make a donation contact André Lipscombe, City of Fremantle Art Collection Curator at [email protected]. The Collection features an impressive number of Australian prints and artists’ books reflecting the diversity and complexity of the medium, and includes all winning works from the Fremantle Arts Centre Print Award by artists such as Raymond Arnold, Rebecca Beardmore, Pat Brassington, Damiano Bertoli, Marion Manifold, Mike Parr and Alick Tipoti. Fremantle’s Collection has evolved over the decades through the generous donations of artists, artists’ families and art collectors. Highlights include a stunning series of paintings and drawings by Australian Impressionist Kathleen O’Connor (1876–1968), donated by the artist’s family, and a remarkable gift by Nyoongar Elder Ken Colbung of Tim Leura Tjapaltjarri’s (1929–1984) painting, Aboriginal people meeting first white settlers at the Swan River. 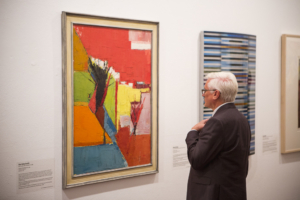 More than 150 works have been donated by prominent collectors, including works by John Coburn, Lloyd Rees, William Dobell, Guy Grey-Smith, Ken Wadrop, Colin Lanceley, Sidney Nolan and Mary Moore. Enjoy regular exhibitions drawn from the City’s Collection in the City of Fremantle Art Collection Gallery, housed in Fremantle Arts Centre.